Dec. 15, 2013, the 41st annual Winterstart cross-country freestyle races starting at Galena Lodge 23 miles north of Ketchum—hosted by Galena Lodge, The Elephant’s Perch, Blaine County Recreation District and the Sun Valley Ski Education Foundation cross-country team and its parent volunteers. A total 83 skiers, 39 female and 44 male. 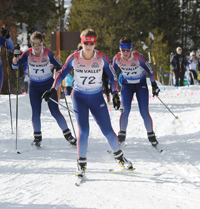 Next local event is The Elephant’s Perch Baker Creek Snowmaker Saturday, Jan. 4 followed by the Sun Valley Ski Club’s Billy’s Bridge 10k on Jan. 18.